I was second in line. Standing behind a blonde, 20-something at the farmer’s market fish stall. Buying fish does not come naturally to me. As a little girl, I had bad eyesight and thick pink spectacles aged barely eight. The cure, according to the local optician, was to eat fish. Lots of it. This was a sign from above by my Bengali fish-loving family, who proceeded to force feed me the stuff. Little bones and all. 22 years later, I see the sense in eating fish occasionally. But the familiar quiver in my knee-high boots returns at every fish counter. Great, I thought. This was going to be really simple. I’ll have what she’s having, as long as it won’t fall apart in a curry. I think the guy shot me an evil. But I scurried off, like a true Bengali all set to make doi maach or yoghurt fish curry. This was a must-have at weddings and social functions at home and cooked traditionally with Rui or carp. I used skate, which worked beautifully in this sweet and spicy Doi Maach curry and had all the above plus a meaty texture. If you can’t beat them, you gotta join them right? Wash the fish well and marinate with the turmeric and chilli powder, some salt and leave to sit in a mixing bowl. Slice one onion finely and puree the other with the ginger. Then bring the sunflower oil to heat over a high flame in a heavy bottomed and preferably non-stick frying pan. When the oil starts sizzling, fry the fish pieces gently on either side until pale brown and well sealed. Now remove them onto to a plate. Next, add the mustard oil to the pan and bring it to heat over a high flame. When it starts sizzling, add the bay leaf and almost immediately the sliced onions. Fry this, stirring regularly until the onions yellow from the turmeric fish marinade starts going golden brown on the edges. At this stage, mix in the pureed onion and ginger. Stir like a maniac on a high flame, helping the whole lot turn a pale golden colour. You will need to keep adding two tablespoons of water at a time to prevent the masalas from sticking to the bottom of the pan. This takes a good 20 minutes and don’t give up too early or the dish will taste raw at the end. While the onion masala cooks, beat the yogurt with an equal amount of warm water, the sugar and flour. This will prevent it from splitting. When the onion stops smelling raw and pungent and takes on a brown colour, lower the flame to low for two minutes. Stir in the yogurt and the green chillies and simmer until the curry has an even pale, golden colour. Add this stage, lower the fish into the curry, sprinkle the garam masala and raisins and leave to simmer until oil reappears through little pores on top of the curry. 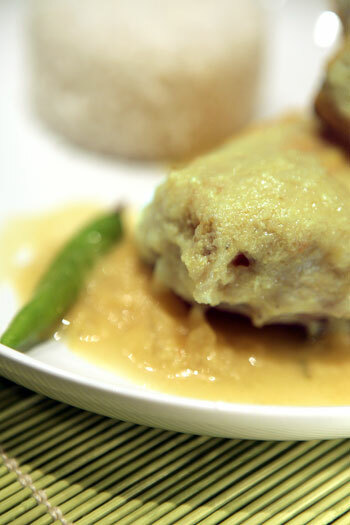 Serve with rice cooked with a tablespoon of ghee for an authentic touch. PS = This is my second entry to Sandeepa’s Bengali food event. I will stop now. Promise! I’ve made the Bihari style aloo chokha, quite similar to your aloo makha, mustard oil and all. Fish curry sorely tempts me to fall off the vegetarian wagon. Sigh. But fish is good for ya – I mean, look at Jeeves. All that fish and remarkable brain. How come I didn’t see your mail ? Did you send or is it buried in my spam folder ? mmmm gorgeous! will try it out! Skate is an adventurous fish to use and this is a fascinating way to cook it – my own experience has been restricted to the French way, Raie au beurre noir (Skate in black butter sauce). I would never have thought to use skate in a curry either. Right, next stop a marinade of turmeric and chili! The love of my life is a bengali boy. We met in Sydney Australia and when he arrived here (years ago)he realised that, in order to survive, he had to teach himself to cook. No expatriate indian blogs in those days, though. I have been the beneficiary of his indian culinary skills and have slowly gained the confidence to cook indian food for him too. So tonight I had your fish curry. Coming from Kolkata he grew up chewing fish heads so instead of using fillets, I bought a whole fish. He polished it off, leaving just a pile of bone shrapnel on the plate. We are going to have to try more of your recipes (and some of the Bong Mom’s too). I don’t think my cooking will ever be good enough for his family, but as long as we can lick the sauce from our fingers together, I’m happy! I simply wanted to leave a simple thoughts to state your website was awesome. I stumbled upon it on bing seek just after going through many other information which was probably not relevant. I thought I might come across this much sooner thinking about how great the info is.